The current conversation around automation and artificial intelligence technologies creates a future vision where humans may not possibly compete against intelligent machines, and that everything that can be automated through deep learning, machine learning, and other AI technologies will be automated. In this article, we focus on general practitioner documentation of the patients’ clinical encounter, and explore how these work practices lend themselves to automation by AI. NHS Primary Care in England faces what at times looks to be insurmountable challenges. The application of automation is seen as a boon to address and alleviate some of these challenges. 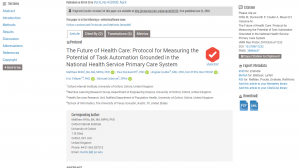 Socio-technical Infrastructures for Healthcare Automation in NHS Primary Care. Automation and computerisation technologies are poised to impact some 47 percent of the U.S. labour market. While automation is typically seen as a threat to workers in many economic sectors, it is an opportunity in the current state of NHS England primary care and general practice services. The early findings reported here are from a recently approved research program that employs ethnography to understand the socio-technical interactions of all primary care staff. With a keen eye on the occupational roles, the tasks those occupations perform, and the tasks technologies perform. A list of other literature and suggested readings that help frame the initial study.